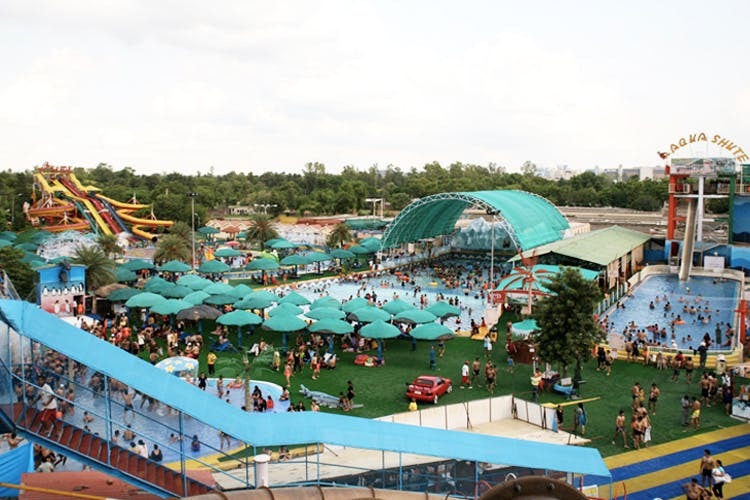 An amusement as well as a water park, Fun ’N’ Food Village is the ideal place to give your kids a break from all their school woes. It has cool rides (including the staples like the ferris wheel and a columbus) and multi-cuisine food stops. Located in Kapshera on the old Delhi-Gurgaon road, this place is a popular haunt for families and kids. Their amusement park has around 16 rides, but you might find yourself rushing to ones that reek of nostalgia, like the Dragon Ride (their take on the columbus), the King Wheel and Disco Disco. The water park has a Lazy River that’s almost 800 feet long, as well as a rain dance area with dance-volume music that you can chill at. If you’re up for something competitive, head to their Multi Racer lanes where you can race (and slide) down next to each other (cool, right?). Most of their rides are not too scary, so it’s a good place let loose and have some fun splashing around. If you get hungry, they have a multi-cuisine dining area where you can grab a bite. With so many fun rides, Fun N Food Village is an awesome place to let loose and spend some quality time with your fam. It's open on all days, and tickets for a couple will cost you INR 2,000 and INR 500 for a child respectively.